Welcome to the oasis of tranquillity that is Apartments Casa Munich. Tucked away in the Ses Salinas Nature Reserve, it offers an authentic Ibiza experience and welcome escape for discerning travellers from all over the world. Casa Munich boasts a series of charming apartments, all of which have an individual style, mixing the traditional Ibicencan white walls with modern luxury to offer a unique, comfortable Ibiza base. There is an apartment to suit every lifestyle, from an intimate and romantic ‘adults only’ theme to a spacious family friendly space. Nestled in beautifully maintained tropical gardens, this is an elegant, relaxing experience in an idyllic Ibiza location. Our double rooms embrace our Mediterranean roots, offering a fresh, elegant space. Each room is individually decorated combining an authentic Ibiza vibe with the luxury you would expect from a top Apartments. The standard rooms are decorated to a comfortable and stylish standard, some of which boasting the privacy and peace that our ‘Adults Only’ section affords. The Deluxe offer a spacious base for your Ibiza adventure and are perfect for families. All have a garden terrace offering an intimate outdoor space, and all are designed to a high quality. The Double Deluxe is the perfect choice for families, it includes a separate bedroom and also has one double bed in the living room. Boasting two separate bedrooms, each with double beds as well as a living/ dining room and private terrace, this apartment is perfect for families looking for a comfortable, relaxed holiday. The facilities within the apartment offer an independence that families apartment that like to come and go as they please. 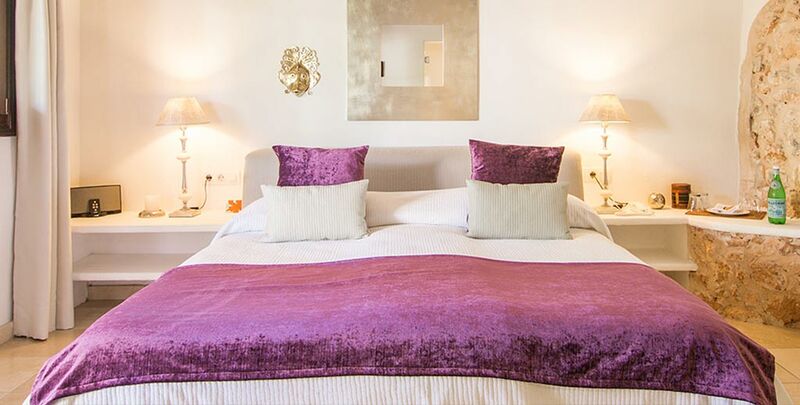 A spacious apartment that offers an elegant base in the heart of the Ibiza countryside, the Senior Apartment is fully equipped and boasts two separate double bedrooms over two levels. The jewell in the Casa Munich crown, some of the Family Apartment boasts views over the salt pools, where sunrise and sunset offer spectacularly colourful vistas, providing a dramatic backdrop to your Ibiza stay. Double bed, bathroom,, ACC/heating, fridge, Tel., TV, Safe, Bose Sound dock for iPhone/iPod, terrace or balcony… Approx. 45m2. *Extra bed: Childs til 12 years: 40€/night and adults 60€/night. Baby bed: free. *Tourism fee of € 2,20 per person per night not included.